The Committee on History firmly believes in the importance of preserving Presbyterian history right across the country. We know, as well, that preservation of church records is a legal requirement of our denomination. Our history is alive in the buildings in which we worship, in the beauty of our stained glass windows, in our books, records and other artifacts. Preserving them is another way in which we Presbyterians can be good stewards, standing behind our faith and ready to pass all of these things on to the generations who will follow us. The Committee has always had a close connection with the Archives. Until the restructuring of 50 Wynford Drive in 1993, the Archives and Archivist were the direct responsibility of the Committee. With the Archives and Records Office now coming under the General Assembly Office, the Committee on History now maintains a connection through an advisory role. The Committee Convener sits as a member of the Archives Committee and the Archivist/Records Administrator sits as a ex-officio member of the Committee on History. Enduring Witness is the Church’s official history, first published in 1975 to honour the centenary of the Union of 1875 and to record the contribution of Presbyterianism to Canadian life. It was written by Dr. John S. Moir and has been revised and updated several times. The most recent edition brings the history of our Church up to the year 2000. A digitized version of the book can now be read on The Presbyterian Church in Canada Archives’ website. The Reformation @ 500 Project was a five-year exploration of how the Reformation speaks to the first decades of the 21st century, 500 years after Martin Luther nailed the 95 Theses to the church door in Wittenberg. In reflecting on the theological insights of the Reformation, scholars have identified five mottos called “solas” because in Latin each of the watchwords used the word sola or a variation of sola. 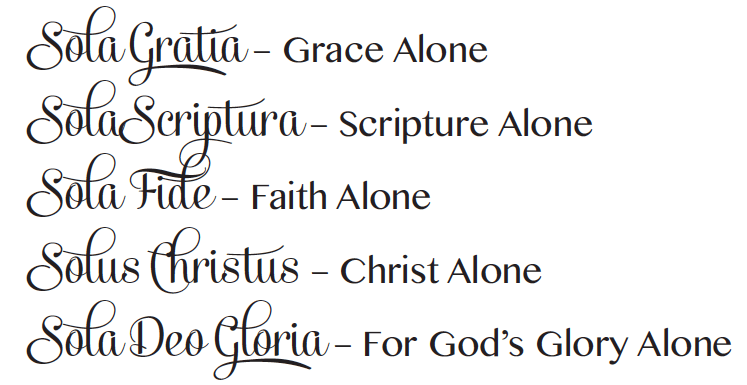 “Sola” means “only” or “alone.” The five solas are: sola gratia, sola fides, sola Scriptura, solus Christus, and soli Deo gloria (grace alone, faith alone, Scripture alone, Christ alone, and for God’s glory alone). Each year an article describing the year’s sola event was published in the Presbyterian Record or the Presbyterian Connection. Click here to download a summary of all the articles. Study guides have been produced for each of the solas, using reflections and insights gleaned from the presentations and conversations. The guides, which can be used individually or in groups, invite participants to reflect on what the 500-year-old theological slogans say to us today. The last of five study guides explores “to God’s glory alone,” using reflections and insights made at an event held at Knox College, Toronto, in October 2017. The day’s presentations can be viewed here. Prepared by representatives at the 143rd General Assembly, 2017, five reflections – one for each sola – was presented in honour of the Reformation celebration. Presbyterian History, a newsletter of the Committee on History, contains articles on various aspects of the history of our church and is published twice a year. The current editor is the Rev. Peter Bush, who is always looking for articles in the 2,000-word range. Producing Communion Tokens in Centennial year in 1975. Publishing four volumes of Called to Witness – biographical sketches of prominent Presbyterians. The Presbyterian Church Index – This project was commenced in 1994 by Michael Millar to compile a list of every Canadian Presbyterian congregation and minister since the 18th century. Publishing 2 volumes of Gifts & Graces, edited by Dr. John Moir – biographical sketches of prominent Presbyterian women. Active Evangelism – A conference hosted by the Committee was held at Knox College on May 24 and 25, 2002. For years congregations have asked us if this type of resource existed for the Presbyterian Church. Who will do the history? How do we record the information? It is fully illustrated production and provides style guides to footnoting, tips on using Archives, and a helpful bibliography. It is available for $2.00. Please order through email or call 1-800-619-7301 ext. 331. No congregation should be without their own copy! This is a project to interview and record the faith and life journeys of ministers, missionaries – ordained and lay, and other Presbyterians with interesting stories to tell. For more information contact Marilyn Repchuck, Convener of the Committee on History. In 2003, the Committee on History established a Canadian Presbyterian History Student Prize of $50.00 to be awarded to students of the three Church Colleges for essays that are selected for publication in Presbyterian History. Each year the Committee awards two prizes of $50 each – one for the best congregational history, and one for the best academic publication. Publications are to be submitted to the Archives and Records Office, 50 Wynford Dr., by the 31st of December each year. All publications under consideration are deposited in the Church Archives following the evaluation process. The 131st General Assembly of the Presbyterian Church in Canada granted permission to rename these prizes “The Rev. Dr. T. Melville Bailey History Prize” in recognition of the late Dr. Bailey’s invaluable contributions to the Committee on History, the Presbyterian Archives, the Presbyterian Museum and the Presbyterian Church in Canada as a whole.